Electric rate “Shock” in Northeast U.S. The winter is setting in on the northeast and many are getting beyond surprised in the shocking jump in the electric/gas bill. 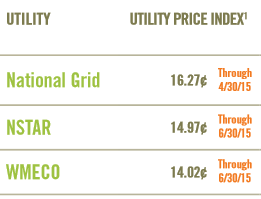 Note that these rates are locked for the next 6 months, except National Grid which is only 4. But more importantly news sources indicate that there is opportunity for even higher rates in the coming years! Would it not be better to lock in a LOWER rate right now and be worry free for the next THREE YEARS. Take for example National Grid at 16.27 or you could lock in a rate of 13.49 for the next 3 years. That’s a 15% savings on the rate! But rate savings aren’t the only thing you could save-how about saving our planet? With energy generated from green sources, you could make a significant positive impact on the environment while saving money on your utility bill. Just put in your zip code and see how much of a difference you can make today. Doesn’t it just make sense to keep money in your pocket instead of paying it to the utility?